Another highlight of the Bolshoi’s season is the return to the fold of Ivan Vasiliev and Natalia Osipova. For one already sold-out night they’ll be starring in The Flames of Paris, Alexei Ratmansky’s re-working of Boris Asafiev’s Soviet drama set in the French Revolution. Fortunately for those unable to get tickets, a DVD and a Blu-ray filmed in 2010 captures Vasiliev and Osipova performing The Flames of Paris with the Bolshoi – their famous pas de deux near the end is one of the most astonishing ballet sequences available on DVD. 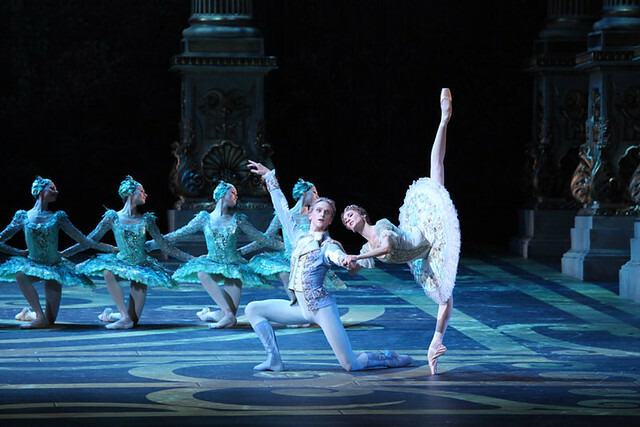 Yuri Grigorovich’s new production of The Sleeping Beauty marked a milestone for the company. It was created to celebrate 2012’s grand re-opening of the Bolshoi Theatre in Moscow and the performance at the ROH is the first time this no-expense-spared extravaganza of astounding courtly scenery and stunning costumes has travelled outside of Russia. The DVD and Blu-ray feature Svetlana Zakharova as Princess Aurora and David Hallberg as her Prince Désiré, the same couple who are scheduled to dance these roles on 6 August. La Bayadère is always popular and the Bolshoi’s lovely production has now been committed to DVD and Blu-ray. Furthermore, to celebrate the Bolshoi’s return to Covent Garden, the Royal Opera House Shop has been granted exclusive rights to sell this brand new recording from 29 July 2013, several months before its official release date in the autumn. The casting is fabulous and features Svetlana Zakharova as Nikiya, Vladislav Lantratov as Solor and Maria Alexandrova as the dastardly Gamzatti – the same trio who’ll be performing at the Royal Opera House on 2 August. Finally, for those who love the historical aspects of dance, there is Treasures of the Russian Ballet, a DVD that shows extracts of Swan Lake from the Bolshoi’s first ever tour to Covent Garden in 1956. Filmed by the BBC under the watchful eye of Margaret Dale, it also includes highlights from Cinderella, Giselle, Gayaneh and Don Quixote (all filmed in 1963) and, as an extra bonus, also features the Kirov performing Act 1 of The Stone Flower at the Royal Opera House in 1960. A number of other Bolshoi Ballet productions are available on DVD and Blu-ray from the Royal Opera House Shop. What!s a pity. No tickets por The Swan Lake!!!! !